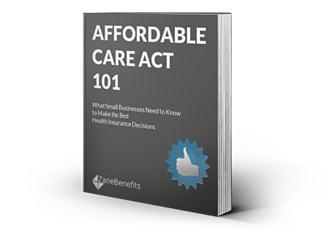 Zane Benefits, which provides small businesses with simple and friendly healthcare solutions, announced today the publication of a new eBook “Affordable Care Act 101.” The new guide helps small business owners understand the Affordable Care Act (ACA) and make the best health insurance decisions. According to Zane Benefits, many small business owners feel uncertain about how the ACA impacts their business, their employees, their family, and their bottom line. In fact, a recent survey by the National Small Business Association found that 58% of small business owners have limited or no understanding about how the ACA impacts their business. Small business owners need to understand their requirements under the ACA, and savvy business owners are using the advantages of the ACA to offer better, more affordable employee health benefits. The new eBook outlines key ACA provisions, provides comprehensive FAQs, and helps businesses navigate their upcoming health insurance decisions. Small business owners, CEOs, CFOs, HR managers, and office managers are invited to download this new guide to better understand the ACA and make the best health insurance decisions for their business and employees.